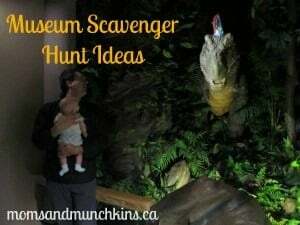 Planning a museum scavenger hunt for your mom and baby group is an excellent indoor group activity! If you are like me, you may be starting to feel a little cooped up at home due to the cold winter weather. Now that the holiday season is over, it’s a great time to plan a mommy and me play date. These museum scavenger hunt ideas are easy to put together – we even have a freebie for you! The great thing about museums is that the admission is usually inexpensive yet there is so much to explore there. To plan your museum scavenger hunt ideas for your mommy and me group, make a trip to your local museum along with a pen, paper and of course your baby. While strolling through the museum, read some of the information along with the displays and start writing down little tidbits of information that you’d like to include in the scavenger hunt. You could include questions about the animals on display (like what type of foods certain animals eat, baby names for various animal species, etc.). This type of scavenger hunt requires the moms to do a bit of reading around the museum to find the answers. It’s also a great opportunity for the little ones to take in the sights of the museum. Be creative but don’t make the questions too tough or some may lose interest. You could also print this museum scavenger hunt for free. During your little one’s nap time, type out your questions (be sure to keep an answer key for yourself) and print off a copy for each mom. Bring along your question sheets and pens to the play date. To start your play date, have all of the moms & little ones arrive at a central location so you can explain the scavenger hunt and hand out your question sheets and pens. Before sending everyone off to start the challenge, set a time to meet back at a central location in the museum. Maybe you want to award a prize to the mom with the most correct answers. If your museum has a cafe, end the play date with some coffee and visiting time. If there isn’t a cafe, there may be a meeting room that the museum will let you use for a short coffee break. What’s your favorite area of the museum? For more fun ideas to enjoy as a family or with your mom & tot group, follow along on Facebook, Twitter, Pinterest or our new RSS feed Bloglovin’.